So what should you expect this weekend? For one, there’s going to be a lot going on — just check out this schedule. With fourteen different events on Friday alone and a slate of over 50 presenters, this year’s Better World by Design promises to be jam-packed. The event kicks off today at noon in Salomon, with opening remarks from Annie Wu of Greater Good Studio. Other speakers not to be missed include Alexis Loyd, Creative Director of New York Times Research & Design Lab, and Jason Severs, Executive Creative Director at frog design. The event exists in blocks that range from 30 minutes to an hour and a half. Be sure to check out the schedule to find which presentations spark your interest, as many run at the same time. Folkmade.org, a website created by a small group of Brown students and led by Fiora MacPherson ’16, provides a platform for College Hill artists to share both their work and their stories. The idea was conceived earlier this year, when MacPherson and some friends decided that it was time to improve connections between Brown/RISD artists and the greater College Hill community. Folkmade’s mission statement illustrates this goal; the website aims to “acknowledge the talent in our community” and “celebrate the homegrown makers of our campus” by giving them a way to share their work and their passion with their neighbors. And the organization has done just that; Folkmade will transform the presence of the local art community in everyday life on College Hill. At folkmade.org, consumers can purchase authentic artwork created by Brown/RISD students. The single unifying feature of the products is their excellent quality; aside from that, the store features a wide array of incredible artwork that spans many styles and mediums. Currently, pieces range in price from $5 to $100 and the product list ranges from oil paintings all the way to literal benches. And that’s only the beginning. According to MacPherson, the online store will grow with time; artwork will be added in frequent intervals, so the store functions as an ever-evolving showcase of the wealth of beautiful art being produced on the Hill. Perhaps you are well acquainted with Blog’s column, This Week at the Avon. Meet the Avon’s sulky, redheaded step-sister hip, closer-to-sea-level competitor, the Cable Car Cinema and Cafe. Cable Car, located on seabreezy South Main Street, has recently been deemed “Best Art House Cinema in New England” by Yankee Magazine. This week, Cable Car has extended their screening of the new, much-anticipated documentary Finding Vivian Maier through Thursday. This film seeks to unveil the mysterious nanny who also happened to be one of the most prolific street photographers of the 20th century. 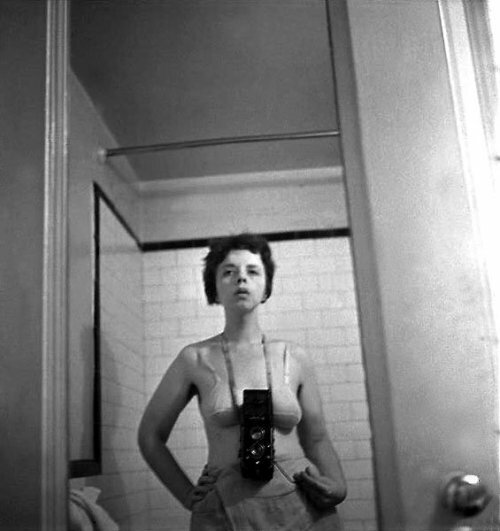 She created work on par with Diane Arbus, Lisette Model, and Robert Frank, but her fruits of her Rolleiflex were unknown to the world until 2007. A 26-year-old real estate agent and director of the film, John Maloof, discovered Maier’s work at a storage auction in Chicago while looking for images of the Windy City to include in a book he was co-authoring at the time. Maier had stashed her work away in boxes, and 100,000 negatives and undeveloped rolls of film had remained unseen until Maloof stumbled upon them. The art world and the general public feel immense gratitude towards Maloof because he made Maier’s work known, but, as the film progresses, the problematic nature of Maloof’s nearly tyrannical possession of the work bubbles to the surface. Maloof had no personal connection to Maier before he bid on a trunk of her negatives for $300, but now he is producing (and profiting from) posthumous prints of her work, and receiving international attention because of Maier’s eccentric story. At times, Finding Vivian Maier comes across as a thinly veiled promotional piece for John Maloof, and it makes the viewer wonder what this film could have been if it had been directed by a third party documentarian. After much anticipation, The Dean Hotel officially opened in downtown Providence on April 3rd with one of the hipper after-parties Fountain Street has ever seen (there was a large, yellow snake involved). In the past few months, The Dean has caught the attention of The New York Times and T Magazine, but now the time has come for the student body to reap the benefits of this local commodity. Why should you check out The Dean Hotel? How is it going to reshape the way you experience Providence as a college town? The Dean has everything the young collegian’s heart could possibly desire. We love The Dean. Let us count the ways. 1. The Dean is a hotel that is inspired by, well, us. The hotel has been carefully curated to exude an eggheaded vibe and the interior design achieves the perfect blend of Ivy League traditionalism and RISD-esque crafty eccentricity. The art, furniture, and objects that adorn the Dean warrant their own Art School(ed) post. The hotel’s website encourages Providence visitors to “come sleep with The Dean.” (How did they know about our crush on KBerge?!?) In reality, few of us will ever leave the twin XLs in our dorm rooms for The Dean’s bunkbeds, but the new hotel provides a viable option for visiting parents, and it outshines all of the other temporary lodging options in the city. The Dean follows in the footsteps of experiential New York hotels like the Ace Hotel and the Standard and brings a taste of that concrete jungle to the streets of downtown Providence, with its own New England twist. Scenario: You find yourself at a house party, and your intrigue is piqued by an unfamiliar collegian across the room, wearing a paint-splattered t-shirt emblazoned with the RISD seal. It’s a classic conundrum: two kids from the opposite sides of town, searching for some common ground. You could initiate conversation with age-old ice breakers—”are your calves so defined from walking up the Hill every day?” or, “is it true that you have 8-hour-long studio classes? !” But why not distinguish yourself as the burgeoning free-thinker you are, and discuss the many artists who walked these streets before you did? Maybe you won’t run into any new RISD kids this semester (they won’t be seeing much daylight as they prepare for their impending final critiques), but why not go home for break and impress your mom with these fun facts about artistic beginnings on College Hill? After all, you live in Providence, the self-proclaimed creative capital of the US, and college has transformed you into a learned sophisticate!